Dental crowns are usually used in both restorative and cosmetic dentistry procedures. In a restorative dentistry procedure, dental crowns are used to preserve the tooth to avoid tooth extraction, dentures, and dental implants. Here at our office, though we are offering all these services, there are some instances that a replacement or surgery isn’t the optimal solution. Minor teeth misalignment can be fixed using dental crowns rather than undergoing through different orthodontic procedures. A dental crown can also hide chipped and cracked tooth. When you have one or more missing teeth, dental crowns can cover them up using dental bridges. Dr. Qureshi will have to attach the replacement teeth to the bridge. If the adjacent teeth are not that strong to support a dental bridge, he will have to attach them to the crown first. 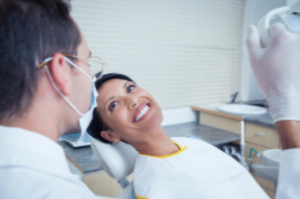 If one or more teeth are discolored or stained, dental crowns can help fix them Although Healthy Smiles of La Grange offers different ways to whiten one’s teeth, it may not be adequate to fix the damage. Dental crowns help hide the discoloration while improving the aesthetic appearance of your smile at the same time. If you are required by Dr. Qureshi to undergo a root canal treatment, he will have to place a crown over the damaged tooth to prevent further infection and decay. Before Dr. Qureshi can affix your newly made crown, he may have to remove some of the tooth enamel first for a perfect fit of your crown. Dental crowns help protect the tooth surface that is noticeable above the gum line. During your first visit, impressions will be taken by Dr. Qureshi and then sent over to a laboratory to start with the fabrication of the crown. After the laboratory fabricates your dental crown, you need to come in for a second appointment to fit the crown. Before attaching the crown, Dr. Qureshi will have to check the tooth to make sure that it is strong enough to have the newly made crown affixed on it. He will then glue the newly made crown with a dental laser. His staff will give you directions or tips to look after your crown. Regular check-up and good oral hygiene practice are needed in order for this dental restoration to last.